This repair is continued from How to Repair Rotted Soffit and Fascia – Part 1. The fascia board and soffit is rotted due to rain water damage where it sits on the roof and must be replaced. I found that laying a ladder on the roof as shown to be quite stable and made working on the steep roof much easier. The gable roof joins (left side with gutter) the main house (right side) to form a valley. The gutter end is trimmed and sloped to match the 12/12 pitch of the main roof. I had these wire mesh flip-up gutter covers installed a few years ago and I don’t recommend them. These gutter covers do a good job at keeping debris out of the gutter with an almost equal amount trash piled on top. The oak and hickory trees behind my house drop catkins in the spring and leaves in the fall. The tulip poplar trees drop blossoms and seeds. The catkins are the worst, long and stringy. A couple of years after repairing the fascia and soffit, I had the roof replaced and installed MasterShield Gutter Covers which have done a superb job. Looking down along the roof edge and flip-up gutter covers. This whole section of gutter needs to come off to replace the fascia board. The far end is two stories high above the back porch deck. Did I mention that I don’t like heights? To replace the rotted fascia and soffit, I need to remove the gutter. The problem is outside gutter corner (see 1st photo at the beginning of this article) is 7 feet above the lower roof and too high to reach while standing on the roof bracket and 2×6 board. I’d be teetering unsafely on the edge, too! My 24 foot extension ladder will just reach over the upper gutter at the corner of the house, but I’d be standing too high on the ladder for safety and still couldn’t reach out far to the do the work. The solution was to rent three sections of scaffolding, aluminum walking boards and wheels from the local tool rental company. A seven (7) day rental cost me only $92.00. (Shop around because some places quoted almost twice as much for a weeks rental!) I rented a truck from Home Depot for $19.95 to haul it myself – if you have a pick up truck then you can use that instead. The total cost for the scaffolding and truck rental both ways was about $140.00. Each section of scaffolding is 5 ft wide by 7 ft long by 5 feet tall. Three sections stacked together are 15 feet high. The scaffold is assembled in sections without tools – two end frames and two cross bars – per cube. I kept the scaffold for the full week to also install new gutter covers and do some painting. I couldn’t have comfortably and safely done this job by myself without the scaffolding. Compared to standing on a ladder, scaffolding is world of improvement. You can stack all your tools on the scaffold and save time versus running up and down a ladder. The locking wheels were essential so I could roll the scaffold the full length of the house along the deck. The gutter wraps around the corner and the two sections are fastened with pop-rivets and sealed with gutter sealant. Pop rivets are easy to remove by drilling off the rivet head with 1/4″ drill bit. The drill cuts through the rivet head to separate it from the rivet body. Take care to not drill through the gutter. 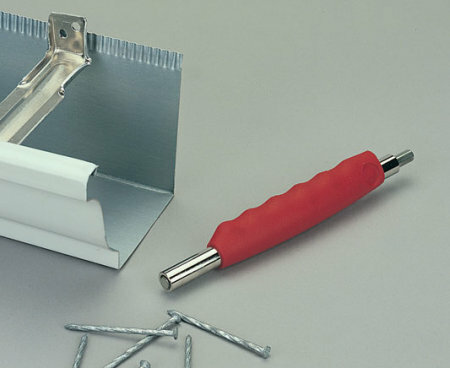 Use a utility knife to cut the gutter sealant to separate the seams. The gutter was easy to remove from the fascia by slipping the flat end of the nail puller behind the head of the gutter spikes and giving it a couple of tapes with the hammer. Most of the gutter spikes were somewhat loose and the gutter came off without trouble. The approx. 12 feet of aluminum gutter was very light and rigid. I’ll rehang the gutter after I install the new fascia and soffit. This project is continued in How to Repair Rotted Soffit and Fascia – Part 3. I am removing the gutters to repair the facia. The “hidden hangers” are nailed through the facia side of the gutter into the facia. The hidden hangers engage the outer edge of the gutter and I cannot remove the hanger from the gutter. I am using a flat end a bar [Brand=”Wonderbar”], driving it up between the facia and the gutter against the bracket nail and prying the gutter and the bracket away from the facia. I think there must be an easier way to do this. Is there a tool available that can remove the bracket from the outer edge of the gutter? Currently, I am bending the inside gutter edge straight up to remove the gutter from the hanger. The better hidden gutter hangers are fastened with hex head screws as shown in the MasterShield Gutter Guard Review series. The Cordless Drill Nail Puller sells for $30 and may simply the job of pulling the nails from the hidden gutter hanger… especially for those hard-to-pull spiral shank nails. You’ll need to expose the nail head by driving the flat Wonderbar between the gutter bracket and gutter as you’ve been doing, then pull the nail the rest of the way out with the Cordless Drill Nail Puller. The Nail Puller will be braced against the gutter hanger/gutter/fascia. The old gutter hanger will be discarded so it doesn’t matter if the bracket is crushed.